It's been so long since i make one of these. Because today i got time i decided to spare it by dropping off a card idea thread-that i've tease since the dawn of time (well, 2 months ago is a pretty long time in paper). Before going in, i want to apologize for my lateness. Though, you might not care about it but it helps me to feel ease at least. Tbh, i was about to throwoff this idea since @Celtaxor ninja'd me (not his fault mate, we're good) but oh boy lucky me did i find a workaround-and it's 10x better from what i've originally planned (imo). Thanks shower thoughts. Anyway, let's start! As a troop, it has no special physics or behavior (as example: Inferno Dragon, Recruits). But as a card, it has a special ability, that is being ignored by enemies when there are other allies on their (enemy) sight. The purpose of this ability is to be invisible, like Royal Ghost. But unlike Royal Ghost, it requires an assistance and she is able to execute this ability while attacking. For mechanic wise, these two are contradicts, where Royal Ghost's invisibility is universal and independent but Phantom Valkyrie's invisibility is specific and dependant to other units, that is yours. ..and also yeah, she deals 360 degrees area damage around her just like her counterpart, the Valkyrie that is. 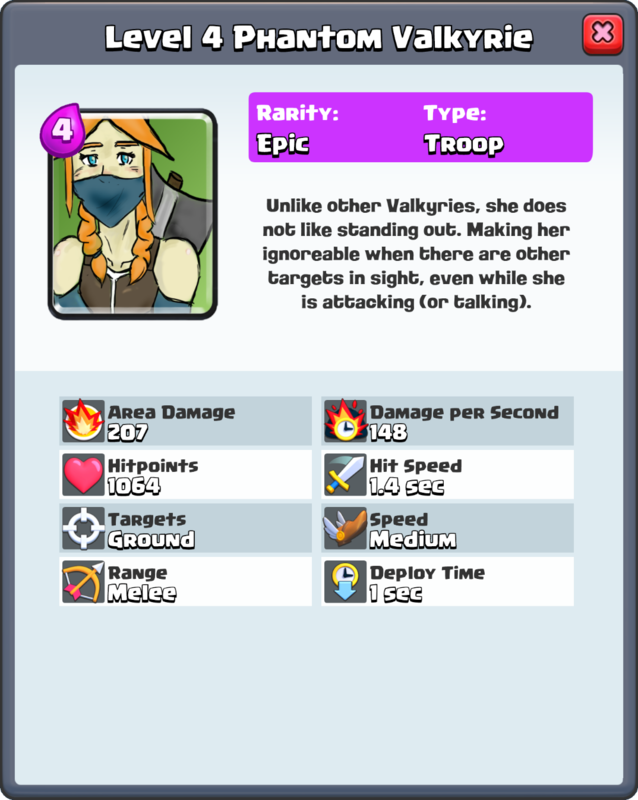 Disclaimer: She is not used like Valkyrie nor Ghost, and here's why. Valkyrie: A reliable counterpusher. What makes her reliable in defense is her high HP, so despite that Phantom Valkyrie (let's call her PV for short) has the ability to swoosh out enemies around and has 7% more DPS-she is not reliable as Valkyrie because the fact that her health is 35% less than a Valkyrie. This also applies to Tanking. Royal Ghost: A pressure. What makes him a great pressure because how cheap and deadly (if countered cheaply) he is on solo. Also he's fast. PV is literally the opposite of any of the existing criteria above. She cannot be targeted by anything when paired with something, so if you want to make her last longer than usual in the enemy side, pair her with a tank (ex: Giant). For exchange, she can wipe out swarms and mini tanks on foot for them. Definitely Mini Pekka and Minion Horde proof (if assisted well). Best part about this is that there are no Zap required to pull this off. Again, She is not a tank, her counterpart is. She is a spank, a very solid one if well assisted. Compensate her with something like Giant, she might be able to take care 3M+Mini Pekka push unscathed. Like Bats and Ice Golem, you might be able to take care of PEKKAs and MKs with PV instead of Bats in that combo. She's probably the toughest Spanker in all of Kite and Spank combos. In case you don't know how to execute this combo, try to kite the target with Ice Golem and chip them from the back with units that are unable to distract the target from Ice Golem. Would be better if the PV kept alive for a strong counterpush (not solo). On Countering, the best strategy to have in mind while countering her in pushes would be trying to pull her out to the side where she is only in your defending units sight. So use something like Ice Golem, and deal her in a range where it's only her at your defending units' sight. What do you think? Please comment to show your support! - Image made by me. Lore? Hmmm... Well, i guess she's an introvert Valkyrie and a less "healthy" looking one too. The name "Phantom" was given to her by the regular Valkyries both as respect and teasing due to her ability to be ignored even when she's attacking or talking. But mostly respect, since Phantom sounds cool as heck. She wears mask because she's abit shy on spotlight, but she do still have the pride and ambition of Valkyries. The reason behind of their existence between Valkyries remained unknowed. Anyway, it's pretty rare to see these kind of Valkyries, so if you do, that'll be pretty EPIC. I don't understand well the invisibility mechanic. Does it work when there are ally troops placed anywhere in the arena? Or when placed in a certain range around the PV? Or neither of those? @JcttehTheWise Neither. But i get that it's pretty confusing. If you read very closely, you should be able to tell that PV is actually a troop that is considered as secondary target. Meaning from the enemy perspective, it is important for them to attack the other unit in their sight than Phantom Valkyrie herself despite if PV's the first thing they saw. So if Phantom Valkyrie is the only thing they see, they just attack her. Her ability isn't literally invisibility, it's just the purpose. It's all prioritizing, a painful image to describe this is if you are talking to a friend then a third person comes. And Afterwards, your friend stopped talking to you and talks to the 3rd person instead. You are the Phantom Valkyrie. Alright, so basically PV turns invisible when other ally troop enters into the enemy troop's sight range right? Then a couple of questions go to my mind: What if the ally troop is another PV? Both of them would be invisible, or both visible? What if PV is on the sight range of an enemy troop with another ally, but at the same time she's in the sight range of another enemy troop without the ally troop inside it? She's invisible for everyone or just for the first enemy troop? Does PV have an invisibility delay, or it's instant? I personally think PV is really OP if there's no delay. 1. PV is always visible, only ignored. So if there is two PVs in the enemy sight range, they'll attack the nearest PV. 2. Reminder that she is not invisible, only ignored. That means the enemy troop that only sees PV can attack her while the enemy troop that see both PV and her ally won't. 3. She's "invisible" to anyone when there are other targets in their sight. 4. It's not an invisibility that works like Royal Ghost. I guess it shouldn't take time for her to be ignored (yes, no delays). Actually that's a pretty sweet idea, I'd love to see it in the game. Much better than ghost.